V IS FOR VINO - Watch. Learn. Drink. | "The Show to Pair with your Wine"
V is for Vino is about to make your wine life a lot more fun. Your personal sommelier Vince is going to take you to a new wine region each episode! Learn the stories and understand the wine: without the studying! Then, you can even buy the wine from the show! No more disappointing bottles, no more wine list intimidation, and no more wine snobs. Ever. Start here! Competition, controversy, and land that sell for 1M an acre! Napa Valley is the quintessential American wine region. It helped the USA gain the recognition it deserved in the wine world, and to this day still brings the thunder; but do you know the story of how it came to be? 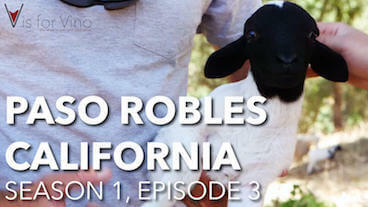 Find out on this premiere episode of V is for Vino. Santa Barbara is my favorite California wine region for the money. Dollar for dollar, nothing competes, especially if you love cool climate wines like Pinot Noir and elegant, restrained Chardonnay. And our restaurant on this episode has a spot close to my heart: it was the place I envisioned for V is for Vino when I came up with the idea years ago, and doggone-it, I got it done. 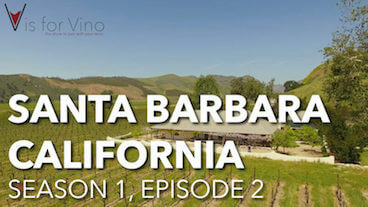 Find out why Santa Barbara is the getaway for the celebs on this episode of V is for Vino. 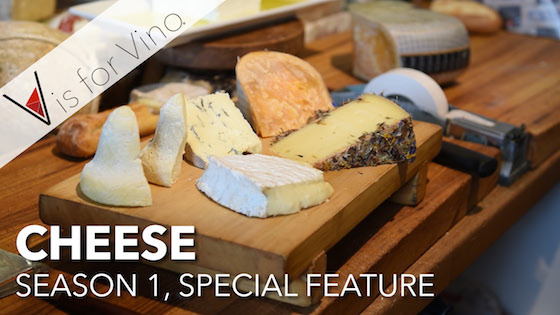 the FREE 30 minute V is for Vino digital show, where your personal sommelier Vince takes you on a wine journey to explore the region, learn the grapes, meet the winemaker, and cook a dish that will pair perfectly. 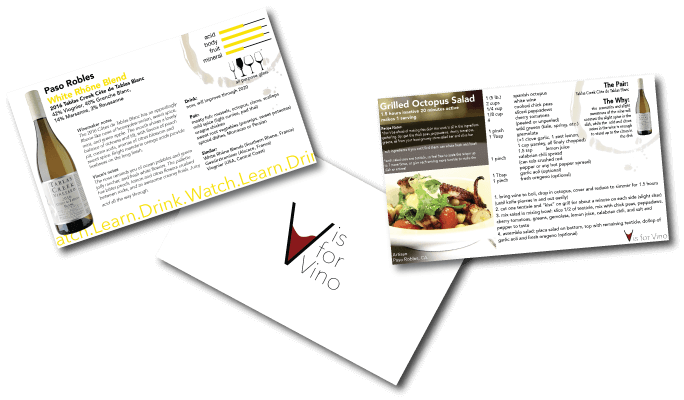 the wine and recipes from the “Vino Cards”. Plus, Vince breaks down wine topics in each episode, so you don’t have to be a pro; just drink like one. the wine from the winemaker on the show! Small batch, hand crafted, killer wines that you can purchase at exclusive discounts. Learn the stories behind the label. Perfect! 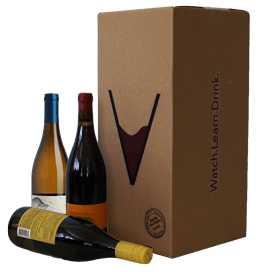 V is for Vino will teach you the basics, without the snobbery. See new wine regions, winemakers, recipes, and grapes! Buying, ordering, pairing, and talking about wine! Vince is a certified sommelier and founder of V is for Vino. While pursing a rock ‘n’ roll career as a guitarist and vocalist, he fell in love with wine while working at the bars and upscale restaurants that paid the bills. As he pursued further wine knowledge, he realized there was no place for the “average Joe” to learn about wine casually (see: without a textbook); and thus, V is for Vino was born. Wine “info-tainment” for the casual wine drinker. Vince runs every aspect of V is for Vino, from the production and editing, to the writing and hosting of the show, to the IT and web design. His passion for wine stems from his desire to pass his knowledge of it onto others. “Love your show! I’ve learned so much from these first three episodes. My wife and I are avid wine collectors and your show helps put words and understanding to our passion!” Chris T.
“So informative, in a style that is easy to understand and remember. This is my new favorite go-to for wine knowledge…. and to learn tasty recipes. I can’t wait to watch more episodes and rewatch the ones already aired!” Victoria A. “I love the series and what you’re doing. You’re energy and passion about wine is awesome! I’ve been looking for shows like yours. I’m loving the fact sheets for the wine and recipe pairing.” Marcin K.